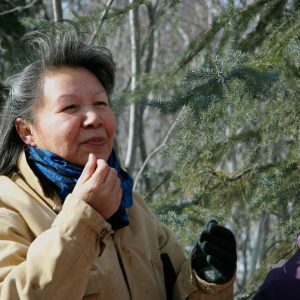 Be’sha Blondin is a First Nation’s Elder from the Sahtu Region of the Northwest Territories with forty years of experience in indigenous traditional healing and living in harmony and balance. From her youth, Be’sha learned about environmental laws, traditional law, life skills, and knowledge and medicines of the land from her family and Elders. She speaks to preserve and to revitalize Aboriginal cultural knowledge and belief systems. She has worked with communities in the North and across Canada for over 35 years delivering land-based healing programs, developing wellness plans, and teaching ceremonies, healing practices, cultural competency and traditional knowledge approaches to wellness. Be’sha is committed to helping her people heal and is excited to be leading the development of a space for Elders to share and practice their traditional teachings, which has been one of her life’s dreams.